ARR is in an apparent infatuation with Naresh Iyer now…time will tell if its the next love. I wondered if there is an element of commonality with these guys? For sure, their wavelengths hit the chord the first time they met. Two, the three guys literally surrendered to Rehman, giving up their career to singing. Three, most importantly, according to me, there is a unique rawness in all of them that only Rehman could sense. Its a simple thing : ‘Everyone wants happiness‘. The more I think about it, I realize that the least common denominator of the wants of every single person is ‘happiness’. I try to extend that argument and say ‘the unlimited list of things we want is not really what we want, but really the means to the real want ‘happiness’. It made sense to me…every want is a means to that one end want : happiness. So it appears as if that all we want is the happiness itself but are fooling ourselves by wanting many other worldly things hoping the pleasure we would feel from getting whatever we want would give that happiness. The reality is that the bottom of that list grows faster than the top and the all pleasures fail to give lasting happiness. But, wait a minute? happiness is an abstract term and there will be at least 5 billion definitions for it…right? Nope, thats the point…the 5 billion definitions are simply the statement of the means to that one happiness. Alright, I know I am driving everyone crazy here! What the heck is happiness then? In one definition, it is a transient state of mind! Note there is not one but three keywords here: transient, state, mind. Transient state because it is never permanant. If we all will ever be permantly happy, we all will be holiest of holy saints, who they say once existed! It is a state of mind because it is inside us and not ouside. Hindu philosophy says Brahma purposefully hid happiness at the deep core of our mind, the last place and most difficult place to find it! When we search outside there are zillion things to find and we would need a million lives to finish that search. Lets say, we all agree with that principle and start searching inside. We would soon realize that there is not much inside to search. Of course, you say. I think we would soon reach a point where we might finally realize happiness is nothing more nothing less than emptiness! we couldn’t have chosen a better day; Jersey is packed with almost two feet of snow and there is nowhere to go but stay put. 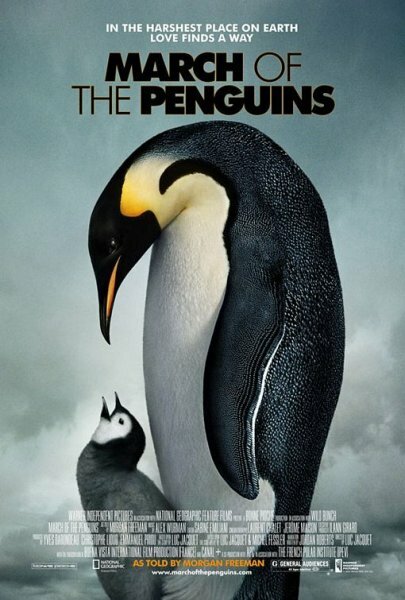 Just before the snow, I grabbed the dvd “March of the Penguins”. If you are ever inspired by nature, you will be spellbound by watching this documentary, in the form of a movie. I vaguely remember the fact about penguins breeding but had never imagined how much they endure during a few month period to procreate. In one of the harshest places on the planet, these penguins show us what love, caring and true survival means. At times, it was scary thinking about the ruthless winter nights and blizzards the penguins must face. At other times, the way they help each other and the cute babies they raise were so adorable, you start loving them endlessly. The cinematography was spectacular and narration by Morgan Freeman was affectionate. Just to realize that these creatures live such an admirable life just at the other part of the earth, I get goose bumps. I must also salute the people who had the courage and passion to film this great act of nature.